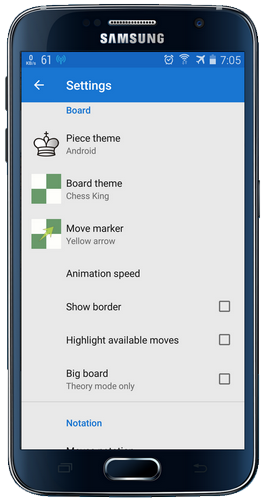 Overview : Chess King Learn is a unique collection of chess education courses. 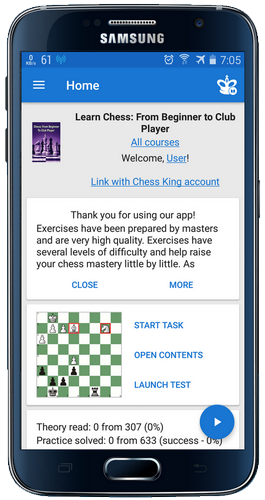 It includes courses in tactics, strategy, openings, middlegame, and endgame, split by levels from beginners to experienced players, and even professional players. In the collection of 59 courses, all are already unlocked. 4 courses are already loaded, the remaining 55 need to be downloaded (they will also be unlocked) by clicking on the link "ALL COURSES" on the main screen. Unlike individual course applications, the weight of courses loaded by this shell is less than 2 MB (often even less than 1 MB). Separately, the applications weigh approximately 8-10 MB or more. Saving space is obvious.